Nicolas Bouvier was Switzerland’s answer to Jack Kerouac. Reviewers tend to band about superlatives with casual abandon these days, declaring second-rate works to be masterpieces, hyping the ordinary. Perhaps these easy eulogies are a response to the sheer volume of new material, as if quantity must inevitably lead to more quality. Or maybe it’s a surrender to the celebrity culture, where notoriety is valued above intrinsic worth. But whatever the cause, this disservice to readers – though not to publishers’ publicity departments – diminishes the power of language, lowers expectations of excellence and makes it very difficult to draw attention to a truly exquisite travel book of exhilarating imagination, especially when it’s over 40 years old. As a child Bouvier’s reading of RL Stevenson, Jules Verne and Jack London made him impatient for the world. He recalled at the age of eight “tracing the course of the Yukon with my thumbnail in the butter on my toast”. His father encouraged him to travel and in 1953, without waiting for the result of his degree, he left bourgeois Switzerland with no intention of returning. In a small, slow Fiat, he and his friend Thierry Vernet – whose stark illustrations are reproduced in this handsome Eland edition – travelled across Europe and Asia over nineteen unforgettable months, pausing in Belgrade, Istanbul, Tabriz and Quetta to paint, write and wait tables, taking longer than Marco Polo – as Bouvier proudly pointed out – to reach Japan. Along the road no sensational, headline-grabbing event befell them. They were not attacked by Baluch bandits or held hostage by an Afghan warlord. They did not climb the Hindu Kush in search of lost treasure. Instead they journeyed humbly, honestly and in near-poverty, failing to get jobs in Turkey, dossing down in a provincial prison in Iran, teaching French in Tehran to raise funds, and finding sanctuary in Quetta in a bar run by a distracted, kindly ex-Welsh Guards officer with “an air of something both luminous and shattered”. Ten years in the writing, The Way of the World is a masterpiece which elevates the mundane to the memorable and captures the thrill of two passionate and curious young men discovering both the world and themselves. 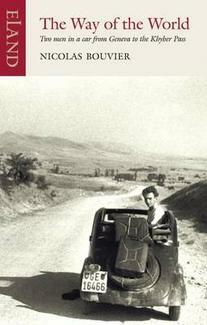 Racy and meditative, romantic and realistic, the book is as brilliant as Patrick Leigh Fermor’s A Time of Gifts, but with its erudition more lightly worn and as alive as Kerouac’s On the Road, though without a whisper of self-aggrandisement. Through that distance Bouvier enables us to rise above faddish celebrity and the sterility of domestic despair, to remember that the world is a beautiful place and to rejoice in humanity. He writes, “Travelling outgrows its motives. It soon proves sufficient in itself. You think you are making a trip, but soon it is making you – or unmaking you.” If you read any travel book this year – or indeed in the next forty years – this should be it. This entry was posted in Excerpt, Travel literature.